We will be back on regular on Wednesday thru Saturday. This time of year I always make creamed honey for holiday gifts. Making creamed honey is easy. It takes about two weeks for the creamed honey to set up, it has to be made by Dec. 7th so it can ready for Christmas. A beekeeper sent me a picture of his Oxalic Acid treatment. He treated his colony with Miteaway Quick Strips (MAQS) in an early September treatment. Then in late October he treated with Oxalic Acid using the dribble method. This is the picture of the mite drop that he had. After you treat with Oxalic Acid, it takes about a week to see all of the results. 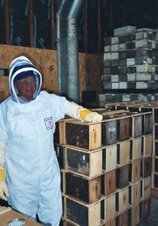 Using this treatment program, this beekeepers hive should now have very low mite levels. His bees will be healthier and in much better shape to take on winter. 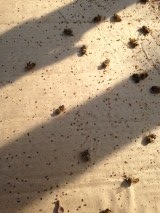 A beekeeper has to remember that in late August - early Sept the hive must be treated with a miteacide. MAQS for example. Oxalic Acid only works on mites that are exposed on an adult bee. Oxalic Acid is not that effective when brood is in the hive. A colony in Minnesota/Wisconsin is usually broodless starting in late October into early February. I will be finally covering my hives over the next couple days. There may be some winter weather coming in on Thanksgiving day and I want to have the hives covered in case of a winter surprise. The weather over the next couple days will be around 40 degrees. All of my hives will be treated with an Oxalic Acid vaporizer. Every hive will be given two winter patties that are placed on the top bars of the top box. The next time I peek at my hives will be in late January or early February. It looks like the weather is going to turn to some more normal temperatures. The forecast has highs in the 30's later in the upcoming week. So covering the hives anytime would be ok for the bees. Even if it hits the low 60's for a day, the bees will be ok. If you haven't treated for Varroa yet. A treatment with oxalic acid will help keep your mite levels low through the winter. You are invited to attend “Pollinator Primer – What’s the buzz?” program at Carpenter St. Croix Valley Nature Center. Ian Lane, an entomology graduate student from UMN Bee Lab will be presenting on aiding native bee species. "Pollinator Primer -- What's the buzz?" will introduce ways to encourage native bees in your yard. You will learn the differences between non-native bees (honeybees) and native bees on how they pollinate and nest. Mr. Lane will also be conducting a hands-on session to create bee hotels and homes for native bees to winter in. Carpenter Nature Center provides unique opportunities for the public to learn and explore nature. “Pollinator Primer – What’s the buzz?” is made possible through a partnership with Ian Lane, entomology graduate student at the University of Minnesota. This educational program is costs $6 per person with special rates offered for “Friends of CNC.” If you have any questions, please contact me or Jennifer at 651-437-4359. If you treated for mites in August, good job. Now you need to treat again. I have heard that many beekeepers that have tested their colony mite levels recently, discovering a re-infestation of mites. Their levels were high again. This high mite level is attributed to hives that were not treated for mites. Some beekeepers have recently discovered their bees have absconded. Honey is there but no bees. Not even dead bees, just no bees. When colonies abscond this time of year or through the winter months it is almost always due to the Varroa Destructor mite. This mite needs to be dealt with and now. Oxalic acid can be used now in a colony. It can work at 40 - 55 degrees for the dribble method. The temperature needed for the vaporizer to work well should be around 40 degrees. The treatment is fast and easy to do. So please consider doing it. The hive you save may be your own. This video show from the Ontario Beekeepers treating their colonies with Oxalic Acid dribble method. Notice they are hitting every seam between the frames with the Oxalic Acid solution. Dribbling the solution right on the bees. Using a graduated 50ml syringe, giving each seam of bees a 5ml dose of the solution. For a total hive treatment of no more than 50ml. He is treating two boxes, but for most of us, the bees should be in the bottom box in a two deep hive or the middle box on a three deep hive.